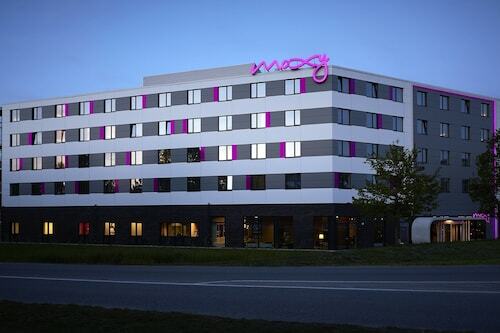 Located in Neuhausen - Nymphenburg, this hotel is within 1 mi (2 km) of Augustiner Keller and Theresienwiese. Marienplatz and Karlsplatz - Stachus are also within 2 mi (3 km). Hackerbrücke S-Bahn is 10 minutes by foot and Donnersbergerbrücke Station is 10 minutes. 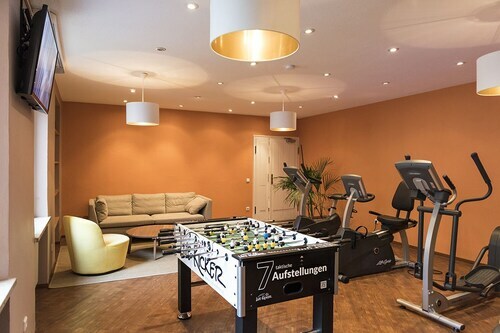 Located in Munich City Centre, this hotel is within 1 mi (2 km) of Augustiner Keller, Church of Our Lady (Frauenkirche), and Rathaus-Glockenspiel. Asamkirche is 1 mi (1.6 km) away. Munich Central Station is only a 5-minute walk and Central U-Bahn is 5 minutes. 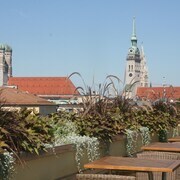 Located in Munich City Centre, this hotel is within a 15-minute walk of Lowenbrau, Koenigsplatz, and Karlsplatz - Stachus. Marienplatz and Theresienwiese are also within 1 mi (2 km). Central U-Bahn is 6 minutes by foot and Stiglmaierplatz U-Bahn is 8 minutes. This family-friendly Munich hotel is located in the historical district, within a 10-minute walk of Koenigsplatz and Karlsplatz - Stachus. Marienplatz and Viktualienmarkt are also within 1 mi (2 km). Central U-Bahn is 5 minutes by foot and Konigsplatz U-Bahn is 5 minutes. 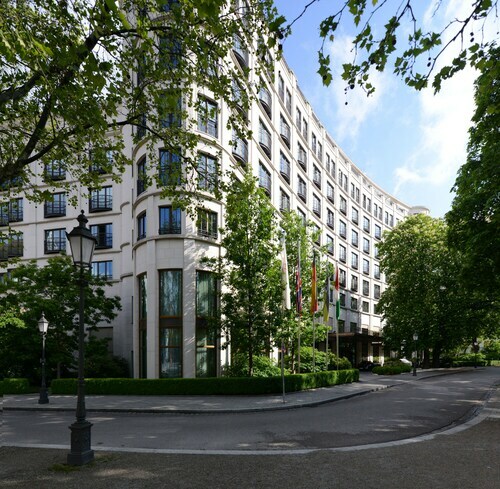 Located amid the fashionable shops of Maximilianstrasse, this former royal guest house is 500 meters from Marienplatz, the National Theater, and the English Garden. How Much is a Hotel Room in Munich? 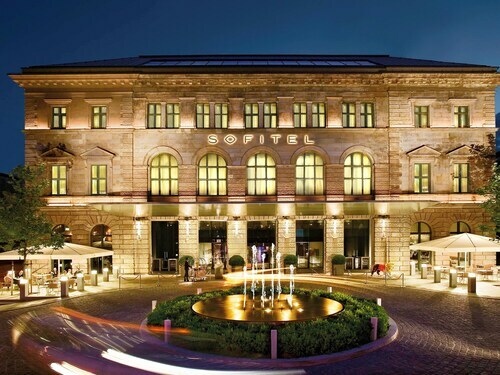 Hotels in Munich start at $15 per night. Prices and availability subject to change. Additional terms may apply. The capital of Bavaria has so much to offer that you could spend weeks exploring it all. One of the most popular times to visit is during the world-famous Oktoberfest, which actually starts in late September most years. This major cultural event is well worth bearing in mind when looking for cheap hotels in Munich during fall. 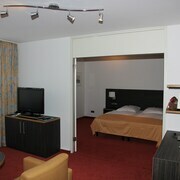 All Munich hotels get busy at this time of year, so be sure to book in advance. When staying in Munich, it is a good idea to find a deal on an organized tour so that you can take in many of the city's best sights and explore the wonderful Bavarian castles and countryside. Hotels near the Bavarian State Library offer easy access to the city center and to the green Englischer Garten, a superb city park. Along with the centrally located hotels that tend to be large and plush, there are plenty more clustered around the main railway terminus to the west. For travelers thinking of a honeymoon destination, try one of the many romantic hotels in Munich, most of which offer suites as well as smaller rooms. You can immerse yourself in Munich's culture and history by visiting its many churches, castles, and museums. A great way to feel the city is to jump on a bike and do a city bike tour - you'll be able to see a lot of the city in short amount of time. Alternatively, a jog around the former Olympic track can provide some inspirational exercise. No trip to Munich would be complete without a visit to at least one bierkeller, or beer hall. 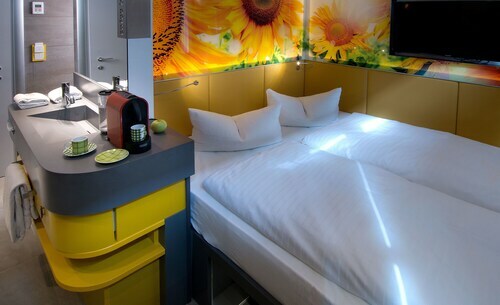 Travelocity can help you to get the best room rates when booking hotels in Munich, whether you are looking for a week-long vacation, a weekend break, or an overnight business meeting. The gentleman at the front desk was it an extreme help . The location was close to the airport, and it had an airport shuttle, which was why I selected this hotel. Everything was clean and the staff were friendly and helpful.